Twitter has been undergoing some serious renovations this last week with the latest addition being interactive, pop-up notifications. 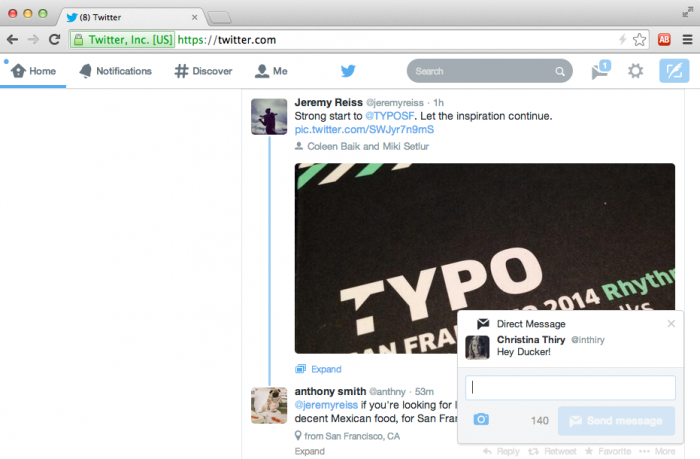 Twitter users can expect to see fully interactive pop-up notifications starting from today. The notifications will appear on the lower right corner of the timeline and will allow users to interact with activity on their account. “When it comes to your interactions on Twitter, it should be easy for you to stay connected to what’s relevant. With this in mind, we’re bringing you real-time notifications on twitter.com when someone is engaging with your Tweets,” stated the company in a blog post. Users will be notified when someone has replied, retweeted or marked their tweets as a favorite. They will also be notified when they receive a message or get a new follower. By clicking on the notification, users will be able to reply to the message or tweet and follow back other users, straight from the pop up. Not a fan of the idea? You can disable the new notifications from the Setting menu or set up notification preferences. “To make sure you’re getting the notifications you want, go to your Settings on twitter.com. That’s where you can choose what types of notifications you want to get on twitter.com and via email and mobile. If you use a Twitter app, check out your settings there too, so you can refine the types of push notifications you receive,” wrote Twitter. This has been one of many announcements for Twitter this week as the company just announced a new Facebook style layout, featuring larger photos and a showcase of trending and popular tweets. What do you think of the new Twitter layout and interactive notifications?